Finishing sixth is not a true reflection of Team Sanya’s performance skipper Mike Sanderson said after completing what he described as the team’s best leg yet. Sanderson’s team, racing the only second-hand boat in the fleet, finished just over 30 minutes after fifth placed Abu Dhabi Ocean Racing and 15 hours after winners Groupama sailing team following more than 5200 nautical miles of racing. 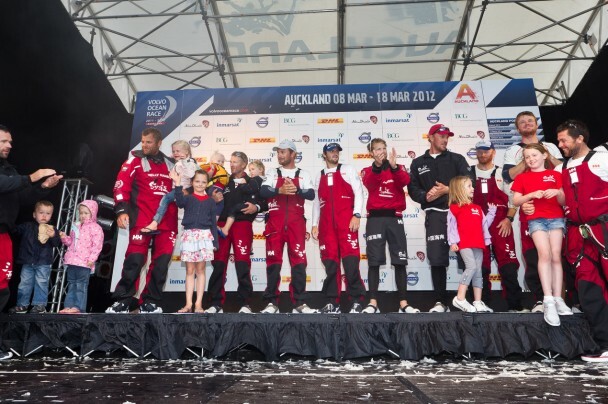 The result thrilled Sanderson, the only New Zealand skipper in the fleet, and capped off the exhilarating experience of finishing in front of a home crowd in his hometown Auckland. "All in all it’s been really tough both mentally and physically. The guys are beaten up and the boat’s in great shape really, but it’s done some hard miles. "It’s wonderful to be home. It was a totally new piece of racetrack for me, and to do that bit of racetrack and end up in New Zealand was unbelievable. Coming down the coast for the last 16 hours or whatever, it’s been amazing." Sanderson and navigator Aksel Magdahl, who called the shots on Ericsson 3 in the 2008-09 race, have already been crunching numbers to get a true gauge of the boat’s performance in comparison to the third generation Volvo Open 70s. The pair like what they see, Sanderson said. "The boat is going faster than this boat has ever gone before, and faster lots of the time than the Ericsson boats were going in the last race,” Sanderson said. Sanderson was also mighty impressed with the performance of his 10 crewmen, who gave their all, and then some more. With five legs remaining Sanderson said he was confident Sanya’s form would continue to improve, and his team could finally claim the scalp of one of their five competitors. Having come so close to beating Ian Walker’s Abu Dhabi Ocean Racing to the Auckland finish line, Sanderson said his team have renewed motivation. "It’s obviously all gain if we could ever beat one of those guys and it’s all bad for them if we do,’’ he said. "It’s going to happen, I hope so anyway. I’ve certainly counted on that.